The popularity of billiards tables in the 20th Century has given them iconic status as a piece of gaming equipment. They’ve managed to achieve a versatility that makes them as well suited for a smoky bar as they are for a sheik penthouse apartment. Regardless of where they are though, they tend to get fairly dirty. It’s easy enough for a silly mistake like spilling a drink to happen for the surface of the table to get damaged. Beyond accidents, even just regular use over time has the power to wreak havoc on a once immaculate billiards table. When buying a billiards table, the notion of having to maintain the thing is the last thing on anyone’s mind. But the fact of the matter is, as with most things in life, proper maintenance in small doses along the way will save you from the headache of having to do major repairs later. Having to replace the top of your table or for that matter, having to replace any part entirely would cost you a lot more than the cost of maintaining those pieces along the way. Which is why we wrote this article…to teach you how to properly clean and maintain your table so it can look and function at its’ best without you having to dig deep in your pockets for the cash for new parts. 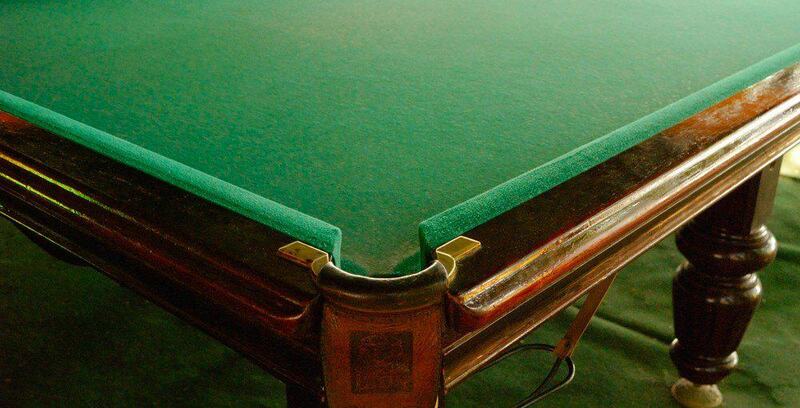 The majority of billiards tables have tops covered in what is usually referred to as felt. While the texture might be similar to that of felt, the material that covers these tables is actually a specialty cloth called ‘billiard cloth’ that is made of either wool, or baize, a blend of wool and nylon. Regardless of which of the two materials your table is covered with, the cleaning process is essentially the same. Wool and baize are both formed via weaving, so they have tiny pores in their surface by nature. As with most porous things, the best way to clean these materials is by brushing them. There are a few companies that make brushes specifically for cleaning billiard tables, but the job can be done without them. Just make sure the brush you’re using has hard and fine bristles. Using the brush, get the dust/other dirt off the raised sides of the table first; doing the sides later would just get the top dirty again if you cleaned it afterwards. Brush the dirt using straight strokes into the nearest pocket to you as you work your way around the table. There’s two ways to tackle this beast and the most efficient depends on the type of table you own. The easiest, by far, is to use a handheld vacuum to empty them out. However, some tables have pockets that are very easy to detach and reattach; if you have one of these tables, the best way to go about cleaning the pockets is to remove them and wash them in warm water with soap. If you don’t have a vacuum cleaner with a nozzle fine enough for the pockets and you don’t have easily removable pockets, there’s no need to fear. You should go about cleaning your table’s pockets out with either a Lysol wipe or a paper towel that you’ve soaked in water and soap yourself. Keep wiping each pocket out until the wipes you’re using stop showing dirt on their surfaces with each wipe. If you do indeed have a handheld vacuum cleaner, it would be a good idea to vacuum the cloth surface of your table after having brushed it in step one. Use caution here though, as a strong enough vacuum cleaner might pull the cloth right off the table. Before you vacuum the whole top, test the vacuum on a small patch of the cloth at one of the corners of the table before vacuuming the whole surface...if the patch stays, go ahead with the rest. And yes, while vacuuming the billiard cloth rather than brushing it might sound awesome to the lazy part of your subconscious, to get the best results you need to do both. After having cleaned the top and pockets of your billiards table, the legs and sides of the table are the remaining elements needing attention. The legs and sides on most tables are made of wood and the best way to clean these are products made specifically for the purpose of cleaning wood surfaces. You’ll find these wood cleaners in the aisles of just about any supermarket, sometimes labeled as wood polish…just make sure the one you get has on its’ label that it is suitable for the type of wood your table is made of. A citrus-based, all-purpose polish is your safest play here. Unfortunately, there’s going to come a time where the wear and tear on your table has surpassed the stages of cleaning. As mentioned earlier, regular cleaning will postpone the need for you to replace any of the parts on your table, but eventually something’s going to give. The billiards cloth is the most likely to go first; but regardless of what gives way to wear and tear first, thankfully e-commerce has made finding replacement parts as easy as a few keystrokes. If there’s something on your table that needs to replaced in a rush, you should give your local sporting good shop a try…but unless you live in some sort of magical pool supply village, you’re most likely going to be better off getting the perfect replacement at the best price online.